If you keep up with us regularly, you probably know by now that we are restlessly eager to unveil the Seventh National Exhibition, Antillean: an Ecology. Led by NE7 curators Holly Bynoe and Michael Edwards, Antillean: an Ecology is a body of works by 51 artists responding to themes of class, race, the economy and privilege. It is our hope that Antillean: an Ecology will encourage members of the public to ask questions, reflect on themselves and enter a space of critical thinking about the implicit and explicit issues that arise from personal and national identity. Influences like citizenship, migration, the landscape, slavery, religion and the creolization and hybridization of the Caribbean and wider world will be explored through artwork, poetry, a mixture of personal and academic essays and a series of panels and artists’ talks. “I think it’s important to understand that we all carry perceptions, whether they’re race, class, economics. So a large part of the show is to interrogate these kinds of perceptions we have. I think it’s important for people to understand that we’re all part of this cultural matrix… And the role of the artist is to challenge these perceptions, to reframe them, to re-constitute and retell a different kind of narrative to challenge people’s perspectives,” explained Edwards. Bynoe believes the exhibition’s significance and relevance in modern day society has spoken for itself through the reaction from the local artist community. Antillean: an Ecology will open at 6 p.m. on Thursday, December 11. Those interested in engaging in the conversation on the social, political and cultural influences on individual and national identity are encouraged to attend the opening night and panel discussions. On my way to work, I noticed that a familiar town had been demolished. Boards and other forms of structure that once housed a community lay broken on the ground. I’ve always known that the town enclosed by trees and bushes was there, but when it was exposed, the size and difference of the town was a shock. I was looking at another way of living, another standard of living; how certain groups of people lived. July 2nd, 2014, Tracy-Ann Perpall, also known as TAP, released a documentary on YouTube called Bwapen: Village Documentary. This documentary gave insight on the burning of a ‘shanty town’ village off of Joe Farrington Road and the Haitian-Bahamian situation in the Bahamas. Perpall’s investigation into this tragedy unearthed tensions between Bahamian landowners and ‘shanty town’ residents, the true conditions of said ‘shanty towns’, and ended by questioning the public. “Does real change occur with dismantling Bwapen, or is it just a band-aid attempting to cover the symptoms of underlying problem” – Tracy Ann Perpall. Over the past year and a half, the government has been working to effectively address and act upon the issue of growing shantytowns within New Providence. Over the past year and a half, the island has experienced a mass exposure of those towns, several fires of buildings in the towns, and demolition and plans of demolition for some areas. These issues of immigration and the living standards of some immigrants and poor Bahamians in the Bahamas have not popped up over night. In 2011, Jeffrey Meris, a graduate of the College of the Bahamas and a Popop Junior Prize Winner, constructed Shanty Town Tea Service, which is on display in the Bahamian Domestic exhibition. As a Haitian-Bahamian, Meris comments on the Haitian-Bahamian situation and the view of said people through the manipulation of clay. The class of a tea service is not often compared or associated with standard of shantytowns. Contradictory in some senses, some may say. The standards of shanty towns deemed as “environments that incubate horrible, horrible health challenges,” by Duane Miller does not compare with the dainty, polished China set utilized during tea parties. In 2011, Jeffrey Meris was concluding his studies at the College of the Bahamas. He commented on the social structure of shantytowns within the Bahamas. In 2014, Tracy-Ann Perpall exposed the social structure of a forgotten shantytown in her documentary. At the later part of 2014, the relevance of the conversation still prevails. During the late part of 2014, on my way to work, I noticed that a familiar town had been demolished. Written by NAGB Gallery Assistant, Jodi Minnis for the Art of the Month. The public is cordially invited to the exhibition opening for Ian Smith's Bahama Jam at 6:30PM, Thursday, November 6th at the National Art Gallery of The Bahamas. Working at The National Art Gallery of the Bahamas (NAGB)* we often have persons come in, asking to rent gallery space for exhibitions and how does one get their work in the NAGB. This shows us that there is a gap in the education between being taught art at your local high school or for persons just delving into their art for the first time, to becoming a professional artist. This new series, Professional Artist 101 will help with those looking to make that transition and will be a monthly article with tips and pointers, like who is a professional artist, how to establish a network or get into the art community, how to exhibit your work and how to eventually get your works in a prominent space like the NAGB. Hard at work: Nastassia Pratt prepping to start a painting. Persons often ask if they only work on Sunday or the weekend would they be considered an artist. In this aspect an artist works should not be judged by the time of the day or week they choose to work rather it is if your consistent, does the community know your working, when last has anyone seen your work has your work grown or changed? These are the things that should be considered rather than what day you choose to work. However a professional artist works and does not only work when inspiration strikes, or when they have the money for this specific thing, they make sacrifices and get the results they want. As we delve into this more we will extend the full answer to this question so please leave a response and join the discussion. * In British and Commonwealth usage, the word gallery alone implies a public gallery. The Bahamas having been a British colony adheres to this term of gallery rather than museum. The NAGB is not a commercial gallery. Rootsy is currently on display at The National Art Gallery of The Bahamas, as part of the Permanent Exhibition: The Bahamian Domestic. Originally on display as part of his solo exhibition, The Surface Beneath, Petit produced this piece after winning the 2012 Central Bank competition. In this piece Petit explores the notion of masking oneself, be it personally or for a wider audience, as the individual in the painting stares at the audience with vacant eyes. Crowned in local foliage, Petite purposely chooses to integrate the Bahamian landscape into his work. This creates connections between artist, artwork and viewer, as the natural motifs provide a familiar point of reference. This common ground culturally integrates the work within a wider dialogue of 'Bahamian art'. Further, it situates the individual in the painting within a natural and cultural landscape, and poses the question: who is he masking himself from? As a Haitian-Bahamian artist, Petit actively integrates his personality and history into his work. Rootsy is thus, a form of self-portraiture, exploring the artist's own identity as it relates to his person, but also his history and culture. As a central piece in The Bahamian Domestic, Rootsy is a particularly strong choice as it directly relates to the exhibition's exploration of Bahamian social and cultural identity. Remaining masked, the piece explores notions of 'Bahamianess' and what, as a nation, we choose to show and choose to hide. This focus on depth, on seeing beyond simple everyday existence, encourages viewers to look below the surface, deeper even. Coupled with the other pieces in The Bahamian Domestic, Rootsy is part of a larger call to notice one's physical, social and cultural landscape and one's place in it. The Bahamian Domestic is on display on the bottom floor at The National Art Gallery of The Bahamas. The Gallery is open from 10AM to 4PM, Tuesday to Saturday and 12PM to 4PM, Sunday. Jackson Petit (born 1983, Nassau, The Bahamas) was educated at The College of The Bahamas and Toronto Film College, Toronto Canada. From 1998 to 2004 he was a participant in the FINCO Summer Art Workshops and has taken part in numerous group exhibitions. He won The Central Bank of The Bahamas Art competition six times in various categories and received top honors in the CLiCO Caribbean Art Competition in 2003. Note: The library is solely a reference facility, therefore materials will not be loaned out. Black and white copies will be provided of any material needed for research, to a limit to be specified in adherence to copyright laws. 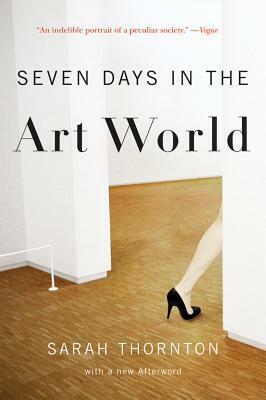 The first book that we shall feature is a nonfiction book that focuses on fast paced vignettes from the art world. Travelling from Christies to the Basel Art Fair, Thornton attempts to portray the everyday adventures that take place in this competitive field. Okay, how can I begin, but to say how I loved my job training experience. Day one of my job training I had a wonderful chance to meet Miss Pratt. She is a kind and very sweet person to meet and know. My first day on Tuesday at The National Art Gallery was a little bit boring. I was getting to know everybody since I am the new girl, but I got a chance to look around and see the most amazing pictures, drawings, and paintings. Later that day I read up on one of the greatest Bahamian artist in The Bahamas, Mr Amos Ferguson. I’ve learnt that he was born in Exuma, that his father was a pastor, he has fourteen brothers and sisters, and he first started painting when he was painting on a house and a vision came to him where Jesus was coming from the sea with a painting in his hands. My second day at The National Art Gallery which was a Wednesday, the fun began. I had a next wonderful chance to meet Miss Wright, Miss A. Wallace-Whitfield and Ms Benjamin. At the start of the day, I worked with Miss Benjamin, whom is also a sweet, nice and very humble woman. She showed me how to send a file, edit your work, and how to save it. Later that day, I got to help hang and paint with two young ladies-Miss Wright and Miss Wallace-Whitfield-whom I came to love like sisters. Miss Wright is a hard worker. When she comes to work, she really comes to “work”. Miss Wallace-Whitfield is a very funny person, who is always happy. Everyday that I am here, I look forward to see her, because I know she is coming to make me smile and have fun. I am very sad to know that I wouldn’t be able to see all these fine and wonderful people whom I have worked with in this week. I love The National Art Gallery because I am doing something that I love. Hello, my name is Sherkeem Rahming and I am 16 years of age. I am also a proud member of the student body of Charles. W. Saunders Baptist School located on Jean Street. I am an aspiring artist who also finds interest in photography and music but art revolves around everything, which is why it is my passion. As a requirement for my school, I have been assigned to do job training at any local constitution which interest me most so I made my decision to work at the National Art Gallery of The Bahamas because of my interest and recommendation from my art teacher. This job training experience duration is with a week time (5 days). Based on my performance an evaluation form will be filled out by my superior and it will be returned to the school. My superior insisted that I do a blog pertaining to what I’ve done and learnt in return for the evaluation form. Based on my assignments given to me, I’ve learned many things about The National Art Gallery of The Bahamas, The Artist and their paintings, The Central Bank etc, but firstly I’d like to give my known information about the artist, Kishan Munroe. Kishan Munroe is an internationally known Artist from Nassau, Bahamas. At the age of 18, Mr. Munroe pursued his career as an aspiring artist, double-majoring in Painting and Visual effects at the Savannah College of Art and Design, he successfully completed his undergraduate work with honors in 2003. He had also completed his graduate studies in Painting in 2005. In doing so, Mr. Munroe’s work has been exhibited internationally and has claimed many awards from the Bahamas his college etc. For my opinion of Mr. Munroe, I see him as a traveller who studies his art and gathers his information based on what his next piece will be on. Kishan’s most recent Paintings and photography was entitled “Swan Song of the Flamingo, It took him 3 years to complete this theme. The theme was entirely made based on the history of The Sinking of HMBS Flamingo and its Roots in United States, Cuba and Bahamas relationships. The sinking of HMBS Flamingo is an historic and grief memory for Bahamians. During this incident, Cubans were illegally fishing (poaching) in Bahamian waters but restrained and ignored when Bahamian marines sent out orders to stop, with no response Bahamian marines disabled the Cuban vessel and discovered 3,000 pounds of fish lobster and conch onboard. On the way to Cay Santo Domingo, Cuban jets seized fire upon the vessel in which the Bahamian Marines were on, Amos Rolle ordered his men to abandon ship but unfortunately 4 of the 19 marines were absent and not to be found by Bahamian and American rescue teams. On a trip with my superior, we travelled to the Central Bank but on our way there we made a stop to Antonius Roberts staying place at the time, Mr. Roberts is also an internationally known Bahamian Artist with years of experience imbued in his sculpturing hands. He was born in Nassau in 1958 and he received his BFA in Painting from Philadelphia College of Arts. He played a major role in the restoration of Villa Doyle as it progressed to being The National Art Gallery of The Bahamas. Over the years of sculpting and painting, Mr. Roberts as grown to be a prestigious award winner internationally and locally, whether its being invited to participate in an event or doing it just for the feel of it, he is always been one to open eyes in amazement. During 2008, Mr. Roberts had been featured in the documentary film “Artist of The Bahamas”. This film explores the distinctive 11 Master Artist of The Bahamas. As of recently, Mr Roberts was working at Baha Mar doing a project, a major resort developer in Cable Beach, embraces his belief conservation and his desire to mentor younger aspiring Bahamian artist. He mentors 12 aspiring craftsmen to build benches out of disregarded wood. Based on given knowledge about Antonius Roberts my opinion of him his clear. He makes use of anything that can be used rather than disregard it and make better use of it. On my experience visiting his place I’ve noticed all of the chairs and trees in which he had made by hand, making coral out of limestone, all sorts of creative things. He is an adventurous man and likes to explore new techniques in which he can create art with. To conclude, based on where I see myself in the future as an artist in different fields, I see my self in Atlanta on SCAD’s campus. Surely I’ve had thoughts about why I would like to go to SCAD. Firstly I would like to state that the actually vision was placed in my head when my teacher, Mr. Rolle had told me about SCAD from then I had imagined myself on their campus all around exploring and learning more about art. Since it was just my teachers opinion I had decided to check out SCAD for myself on their website and on youtube. I am positive there had not been anything I’ve seen that I had not liked, with an exception of the intuition. Shortly after my imagination had lead me down the path of pursuing my destination to SCAD my teacher had invited Brandy, One of the administrators at SCAD Atlanta, she had briefly explained to me the courses SCAD provides and how they can benefit you. She was already a nice lady who drew my attention with kindness and a smile, soon realizing she is the one who provides international and local students with scholarships. I found an opportunity which had made me want to go even more. Meeting Kishan, he had also explained to me why I should not get my dreams fixated on SCAD, I should explore more colleges abroad and see where I can get my moneys worth for the things I love to do. With this knowledge from Kishan, I’ve decided that SCAD will still be my top college for the time being in which I would like to go to but I still will check out other colleges. What will determine if I will pursue my dream of going on SCAD will be the Summer program what they will be having. I will attend and We’ll see what all they have to offer. In continuation with the Ministry of Youth, Sports and Culture’s art theme, “The Journey Continues” for the Bahamas’ 40th year of Independence, the exhibition has continued in a foreign venue. The inaugural exhibition opened at The National Art Gallery of The Bahamas on October 21st, 2013, in collaboration with the Education Department here at the NAGB. For information on this great achievement by our students, please click here. My experience as an intern at the National Art Gallery Bahamas, was a phenomenal one. On the first day, February 3, 2014, I took a tour of the building for the first time. Just walking through the gallery was fascinating, seeing the strange, yet intriguing designs of some of the best artist in The Bahamas and some who even worked here. When I went upstairs to the exhibition Swan Song of The Flamingo, based on the sinking of the flamingo, I was shocked at the information displayed that I was not previously aware of. Walking through the exhibition, made me feel as though I was experiencing this incident. After, I typed out my intentions until I left for the day at 4. Day 2, morning I typed out a biography on the artist who caught my attention the most and why. I then went on to library work, where I copied newspaper articles about art and culture and sorted them to be put in a folder. My third day was another wonderful day. First, I had to finish off the library work then I got a chance to assist with a tour. Later that day, I helped to prepare for a valentine’s programme that would be held at the gallery on Saturday, by cutting hearts. Day 4, I had to finish prepare for the programme, cutting out different designs for another creative piece. My last day here, February 7, 2014, I packed candy bags for the programme, made corrections to the minor mistakes on the other designs and get everything sorted out for the day. After which, I sat and typed my blog about my experience. To sum things up it was a magnificent week. Kareem Mortimer's Short film: "Passage"
Screening of young, award-wining Bahamian filmmaker Kareem Mortimer's short film "Passage," which tackles the harrowing subject of immigration; the 15-minute film will be preceded by a "making-of" that explores the director's motivation. Following the screenings, which will take place in the T1-Ballroom Gallery at 6 p.m. on Thursday, January 23rd, there will be a panel discussion, moderated by radio personality Louby Georges, host of "The Creole Connection" on Guardian Talk Radio 96.9, with participants including the film's director; R.E. Barnes from Amnesty International; Erin Greene, the interim Deputy Chairman of CARFA; and a representative from the United Haitian-Bahamian Association. WE invite you to attend and participate in this very important discussion. If you have a Facebook account, and would like to let us know you are coming, click here.